Jani-King of Reno is proud to announce its latest professional sports partnership and stadium cleaning agreement with the Reno Aces. As the Triple A affiliate to the Arizona Diamondbacks, the Aces and Greater Nevada field provide a great partnership opportunity for the local Jani-King office and its franchisees who provide cleaning services. Working for over a year to get the agreement in place, Jani-King and the Aces inked the new deal just in time for the first event clean at the Aces home opener on April 5. The Aces hosted the University of Nevada that evening for a successful fundraising event and a great start to the 2016 baseball season in Reno. The Aces and Greater Nevada Field create a huge opportunity for our brand to be experienced throughout the area. Jani-King of Reno is recognized as the Official Cleaning Company of the Reno Aces and we intend to promote that partnership through game day program advertisements and table top messages to be placed in each suite. The suites are a perfect place to get our message out to the business owners and community leaders of northern Nevada. We look forward to a great season of service and baseball. 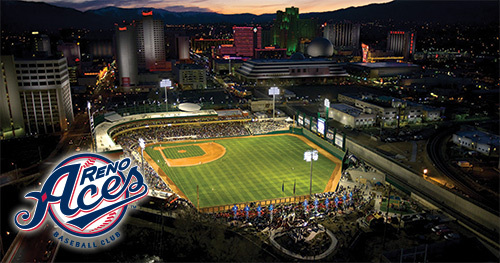 In 2015, The Reno Aces were the 2nd most attended sports event in Northern Nevada with over 375,000 fans in attendance. A 5000+ increase in fans from 2014.